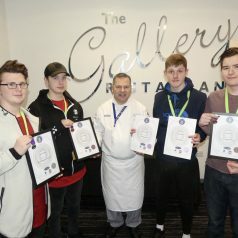 We’re delighted to reveal four Grimsby Institute Hospitality learners have picked up five awards at one of the UK’s largest and most prestigious chef competitions. Fourteen learners from Hospitality Services and Professional Cookery took part in the Salon Culinaire contest, held alongside The Foodservice Show and The Professional Kitchen Show at Birmingham NEC. Oliver Storrer won a silver medal for his butchery of a whole chicken, while his brother Ben gained bronze in the flan decoration category. Also celebrating were Jack Harris, who won bronze for lemon sole filleting, and David Evans, who received merits for his avocado starter and flan decoration. Jack, who said his “love for catering” convinced him to enrol on the course, dreams of opening his own bakery in New York after completing a Level 3 qualification. “The Level 3 course gives you the opportunity to go to America, so I’d like to have the chance to see if I like it and whether it’s what I want to do. David also commented: “I want to be a chef because that’s what I enjoyed most at school. The opportunities you get at college give you a better chance of employment. Oliver, who won a silver, said he “did better than I thought”, while brother Ben also “expected to get less” than his bronze award. Tutor Chris Wood, who attended Salon Culinaire alongside the learners, said he was “extremely proud” of their achievements. “What sets them apart is their focus on a particular task. They’ve taken on board the direction they’ve been given and practised and practised, to the point they’re competent at the skill required.